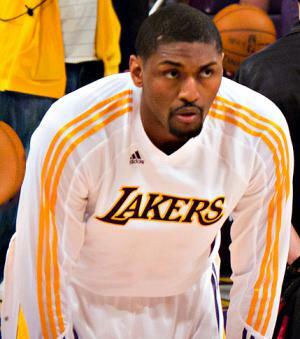 Ronald William Artest, Jr., wasborn on the 13th November 1979 in Queens, New York City, USA, but changed his name to Metta World Peace in 2011. He is a professional basketball player, who is probably best known for playing in the position of small forward in the National Basketball Association (NBA) for the Los Angeles Lakers. He is also recognized as an actor and rapper. His professional career has been active since 1999. Have you ever wondered how rich Ron Artest is, as of early 2016? According to sources, it is estimated that the total size of Ron’s net worth is currently over $35 million; his annual salary is $7.2 million. The main source of this amount of money is coming from his successful career in the sports industry as a professional basketball player. Other sourcesare from his acting and music careers. Ron Artest was raised with two younger brothers. He started playing basketball while he attended La Salle Academy high school, where he played in the school team. Later, Ron enrolled at the St. John’s University for two years, and played basketball for the Red Storm. He was one of the best players on the team which reached Elite Eight of the NCAA Division I Tournament, however, they lost to the Ohio State. In his last year at the University, Ron received the Haggerty Award and was named into the First-team All-Big East. Ron entered the 1999 NBA Draft, in which he was selected as the 16th overall pick by the Chicago Bulls. He stayed with the Bulls until the mid of the 2001-2002 season, when he was traded to the Indiana Pacers, with players Brad Miller, Kevin Ollie and Ron Mercer, for Travis Best, Norman Richardson and Jalen Rose, and in addition Chicago was given rights for a second round pick. While in Chicago, Ron played in 175 games, averaging 12.5 points a game, and had four rebounds on average. Ron stayed in Indiana until 2006, when he asked to be traded after a suspension of 86 games, which he received after he and several other players of Indiana and Detroit Pistons were involved in on court altercation. However, he played his best basketball at Indiana, averaging 18.3 points a game, and had 5.7 rebounds and 3.7 assists per game. He earned All-Star appearance as a reserve in 2004, and was also named as the Defensive Player of The Year in 2004. In 2006 he was traded to the Sacramento Kings for Predrag Stojakovic, and stayed with the Kings until 2008, which increased further his net worth. However he was then traded to the Houston Rockets in 2008, but spent only one season there. Afterwards, Ron signed a contract with the Los Angeles Lakers worth $33 million for a period of five years, however, in his final year of contract, the Lakers used the amnesty clause and Ron was waived. Following his departure from the Lakers, Ron signed a contract with the New York Knicks, which further increased his net worth; however, in 2014 he was also released by the club. He continued his basketball career in China, playing for the Sichuan Blue Whales, staying there for several months, which only added to his net worth, and after that he signed a contract with the Italian basketball team Pallacanestro Cantu, before he returned to the Los Angeles Lakers in 2015. Apart from his successful career as a professional basketball player, Ron is active in the entertainment industry as an actor and hip hop recorder – he has his own reality TV show entitled “They Call Me Crazy”. Ron is also known for founding the Artest Media Group, which has added a lot to his net worth. In 2006, he released the album “My World”, which features guest artists Capone and P. Diddy, among many others. Regarding his personal life, Ron Artest was married to Kimsha Artest, a TV personality known for appearance in the reality TV show “Basketball Wives: LA”, from 2003 to 2009, with whom he has three children. He also has a child with his ex-girlfriend Jennifer Palma. 1 (January 25) Traded to the Sacramento Kings for 'Peja Stojakovic'. 2 (August 14) Traded to the Houston Rockets. 3 Legally changed his name in September 2011 to Metta World Peace (his NBA jersey has World Peace on the back). 4 Grew up in the Queensbridge Public Housing Projects in New York. 5 Jennifer Palma is the mother of Ron's son Jeron. 6 Ron and Kimsha Artest had been in a relationship since 1994, when he was age 15, she age 14. They have 3 children together: Sade, Ron 3, and Diamond. 7 Attended LaSalle Academy in New York, NY. 9 Received the longest suspension in NBA history - 86 games (73 regular season, 13 playoffs) for his involvement in the infamous "Palace Brawl" with Detroit Pistons fans on November 19, 2004. Teammates 'Jermaine O'Neal (I)' and Stephen Jackson were also involved. 10 Drafted 16th in the first round by the Chicago Bulls in the 1999 NBA Draft.